How are adult mosquitoes controlled? 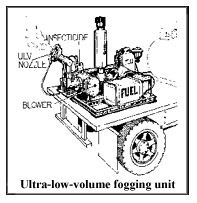 Mosquito control agencies use truck-mounted fogging units to apply insecticides as an ultra-low-volume (ULV) spray. ULV spray units dispense very fine aerosol droplets (fog) that stay aloft and kill mosquitoes on contact. The amount of insecticide sprayed by ULV units is small compared to the area treated, usually about 3 to 5 ounces per acre, which minimizes exposure and risks to people and the environment. Some communities have thermal foggers that use an oil carrier that is heated to disperse the pesticide in a dense smoke-like fog. What agency conducts mosquito control in my town? With a few exceptions, where mosquito control is conducted, it is locally funded and carried out by village or city governments. Some communities are part of a local government agency called a mosquito abatement district that receives local property taxes to conduct mosquito control operations. Why is the local government fogging for mosquitoes in my community? Some communities decide to fog because of the nuisance caused by hoards of biting mosquitoes. In some situations, officials may decide to fog because testing of mosquitoes and wild birds may have shown that mosquito-borne West Nile virus or St. Louis encephalitis virus is present in the community. Contact your local government or mosquito control agency to determine why that agency has decided to fog for mosquitoes. Why do they fog for mosquitoes when I am out taking my evening walk? The best time to kill adult mosquitoes by fogging is at dusk, when they are most active and looking for food (mosquitoes feed on human or animal blood). The aerosol fog primarily targets flying mosquitoes, which is why the timing of the spray is critical. Will local officials notify me before fogging? There is no law in Illinois that requires local governments to notify citizens before fogging for mosquitoes. However, many mosquito control agencies will notify individuals whorequest notification before fogging begins. Contact your local government office or mosquito control agency if you wish to be notified. What insecticides are used to fog for mosquitoes? The most commonly used products are synthetic pyrethroid insecticides (such as Scourge ®and Anvil ®), pyrethrins and malathion. All insecticides used for mosquito control in Illinois must be registered with the U.S. Environmental Protection Agency (USEPA) and the Illinois Department of Agriculture (IDA). You can find fact sheets about some insecticides commonly used to kill mosquitoes on the USEPA web site, <http://www.epa.gov/opp00001/factsheets/skeeters.htm>. How long does the fog kill mosquitoes? During the fogging, flying mosquitoes within the treated area are killed. Although the local mosquito population is reduced for a few days, fogging does not prevent mosquitoes from re-entering the area. If the city has been fogged for mosquitoes, are all mosquitoes in my area eliminated? Wear light-colored protective clothing. Tightly woven materials that cover arms and legs provide some protection from mosquito bites. Keep trouser legs tucked into boots or socks, and collars buttoned. Make sure door and window screens fit tightly and all holes are repaired. Use mosquito netting when sleeping outdoors or in an unscreened structure, and to protect small babies any time they are outside. If participating in outdoor activities when mosquitoes are biting, wear protective clothing (shoes, socks, shirt and long pants). For additional protection from mosquitoes, use an insect repellent. The more DEET a product contains, the longer the repellant can protect against mosquito bites. However, concentrations higher than 50 percent do not increase the length of protection. For most situations, 10 percent to 25 percent DEET is adequate. Apply repellents to clothes whenever possible; apply sparingly to exposed skin if label permits. Consult a physician before using repellents on young children. Are the insecticides used for fogging safe? The USEPA reviews and approves insecticides (and other pesticides) and their labeling to ensure those used to protect public health are applied by methods that minimize the risk of human exposure and adverse health and environmental effects. Generally, there is no need to relocate during mosquito control fogging. The insecticides have been evaluated for this use and have been found to pose minimal risk to human health and the environment when used according to label directions. For example, USEPA has estimated the exposure and risks to both adults and children posed by ULV aerial and ground applications of the insecticides malathion and naled. Listen and watch for announcements in the local media about fogging for mosquitoes and remain indoors during the application in your neighborhood. If possible, remain inside whenever fogging takes place. People who suffer from chemical sensitivities or feel fogging could aggravate a preexisting health condition should consult their doctor or local health department and take special measures to avoid exposure. Close windows and doors and turn off your air conditioning (or set it to circulate indoor air) when fogging is taking place in the immediate area. Do not let children play near or behind truck-mounted applicators when they are in use. To ensure the fogging trucks have left the area, keep children inside during fogging and for about one hour after fogging. Bring pets inside and cover ornamental fish ponds to avoid direct exposure. Consult your doctor if you think you are experiencing health effects from the fogging. More information about spraying for adult mosquitoes may be found on the USEPA's Web site: <http://www.epa.gov/pesticides/citizens/pmcfs.pdf>. Do I need to wash home-grown fruits and vegetables after the mosquito fogging? The amount of insecticide used to fog for adult mosquitoes is much smaller than that used to spray fruit and vegetable insect pests. However, it is always a good idea to wash fruits and vegetables before eating them to remove soil and other contaminants. What should I do if I have medical questions about insecticides? If you suspect that you are reacting to an insecticide, call your physician or local poison control center. The Illinois Poison Center emergency telephone number is 1-800-222-1222; 312-906-6185 (TTY/TDD). Additional information about the active ingredients in insecticides may be obtained from the National Pesticide Information Center (NPIC) at 1-800-858-7378 from 8:30 a.m. to 6:30 p.m. (Central time) seven days a week, excluding holidays; or visit NPIC's Web site at <http://npic.orst.edu/>. Will the fogging kill birds or other large animals? During the pesticide registration process, USEPA considers the effect of insecticides on wildlife. If the insecticide is applied according to label directions, wildlife should not be killed or injured with the exception of insects similar in size to mosquitoes. If you have any concerns about this issue after they have sprayed in your area, contact IDA. Are individuals who do mosquito control required to be licensed? Yes, all individuals who use insecticides to control mosquitoes are required to be licensed by IDA. There are two exceptions: homeowners who fog for mosquitoes on their own residential property and individuals who use certain insecticides to treat tires for mosquitoes at tire shops, tire recycling sites and similar businesses. For information about mosquito control licensing, call IDA at 217-785-2427. Can I fog my backyard for mosquitoes? If you choose to fog your yard for mosquitoes, be sure to use only insecticides labeled for control of adult mosquitoes. Be sure to follow the label directions exactly. However, spraying your backyard with an insecticidal fog or mist is effective only for a short time. If the insecticide label permits, spraying dense vegetation like that found along the edge of a woods where mosquitoes rest will last somewhat longer. Mosquitoes will return when the effect of the spray has ended. Can I treat a depression that floods in my backyard for mosquitoes? If the depression floods for 10 or more days, it can produce mosquitoes. However, use ONLY insecticides that are labeled for treating water for mosquitoes. Small impoundments of water can be treated for mosquito larvae with "Bti," a bacterial insecticide. One product that is available at many hardware stores for this purpose is doughnut-shaped Bti briquets (Mosquito Dunks ®). Be sure to follow the insecticide label directions exactly. Can communities use other methods to control mosquitoes besides fogging? Yes, some communities conduct community-wide mosquito abatement programs. Whenever possible, the primary effort of such programs should be identification of mosquito-breeding sites, followed by removal or treatment of these sites with an insecticide used for control of mosquito larvae (the immature form of a mosquito). Also, homeowners should remove old tires and other unused water-holding containers, change the water in birdbaths, and drain wading pools weekly. Insect light electrocutors ("bug zappers") or sound devices do little to reduce biting mosquitoes in an area. Installing bird or bat houses to attract these insect-eating animals has been suggested as a method of mosquito control. However, there is little scientific evidence that this significantly reduces the mosquito population around homes. More information about mosquito control methods may be found at <http://www.epa.gov/pesticides/citizens/mosquitojoint.htm>. Where can I get more information on West Nile virus? Call your local health department or the Illinois Department of Public Health at the telephone numbers listed below, or visit the Department's Web site, and the U.S. Centers for Disease Control and Prevention's West Nile virus Web site: <http://www.cdc.gov/ncidod/dvbid/westnile/index.htm>.